The West Clare Walking Club had its genesis in a charity event in late September when a group of walking enthusiasts scaled the summits of Carrantuohill and Mount Brandon on successive days. The appeal of the great outdoors and the invigorating thrill of having reached the summits crystallised the desire among these enthusiasts for a more structured approach to the leisurely pursuit of walking. 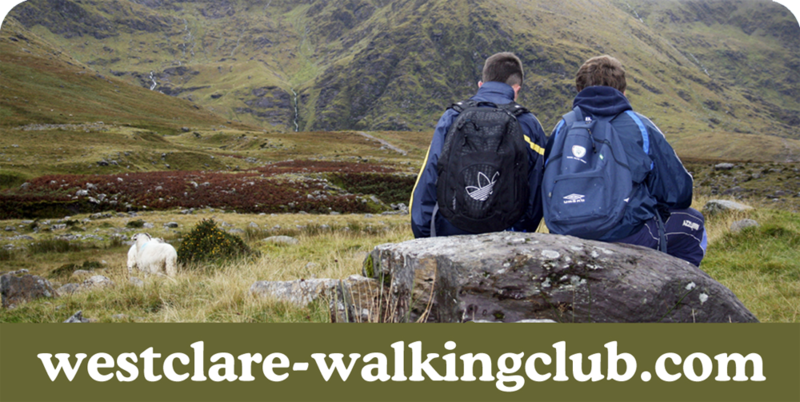 Consequently, a meeting was arranged for the night of Thursday, October 7 in Ennis with the view to establishing and putting The West Clare Walking Club on a sound footing. On the night the parishes of Doonbeg, Kilmurry Ibrickane, Miltown Malbay, Inagh, Kilrush, Cooraclare, Fanore, Sixmilebridge, Doora-Barefield, Kildysart and Ennis were all represented and there was a genuine appetite for putting structures in place and organising walks on a regular and informed basis. Officers elected at that inaugural meeting were Chairman: Joe Lillis; Vice Chairman: Davy Fitzgerald; Secretary: Paul Hally; Treasurer: PJ Kelly; Registrar: Concepta Lillis; PRO: Michael 0’Doherty and Youth Officer, Tina Downes. Committee Members included: Michael McDonagh, Jo Ann Moloney, Michael Considine, Paddy Connole, Kevin McCormack, Breeda O’Dwyer and Ollie Baker. The club is very much in its infancy but a schedule of walks is currently being formulated. Details of this schedule is posted on the website under Walks Schedules.